When we cook whole chickens on the BGE, we generally like to spatchcock them and we usually do two or more if we have the time. Its a pretty simple, fool proof method of cooking them that doesn’t require much attention of the cook. The reason we like to do two or more is to have leftovers for later in the week to toss in casseroles or other chicken dishes (or to vacuum seal and freeze later). This past Sunday, the weather was beautiful and we didn’t have any prior engagements demanding our time, so we decided to enjoy the weather, let the dogs play in the yard and cooked up a few yardbirds. 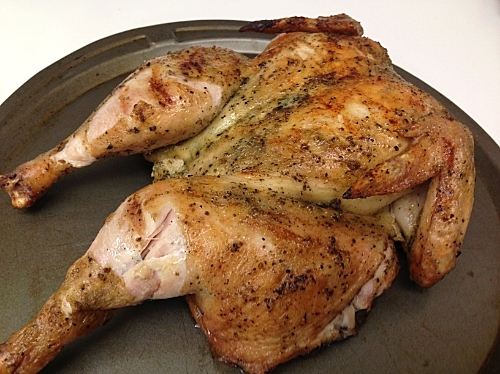 One spatchcocked chicken cooked solely for casseroles or other dishes. When we cooked up this bird, I had no idea what we were going to use it for. Still didn’t yesterday morning. Now, Mrs. G has an arsenal of casserole dishes that she can whip up on the spot, but I was looking for something a bit different from the ones she normally makes. And then it hit me, why not make it Tex-Mex? 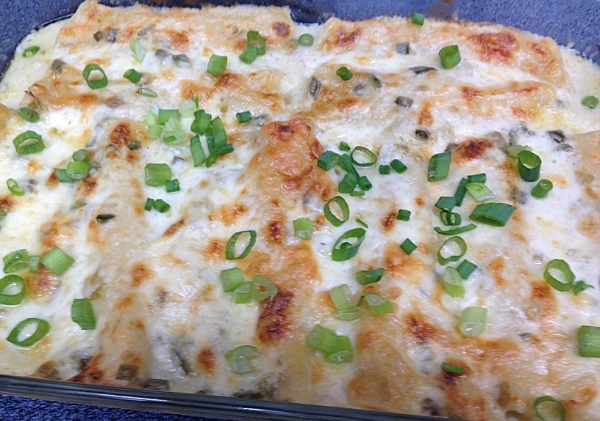 How about some sour cream enchiladas? So off to the internet I went to gather some ideas, comparing recipes and ingredients for inspiration until I could come up with my own. Every good sauce begins with making a roux. 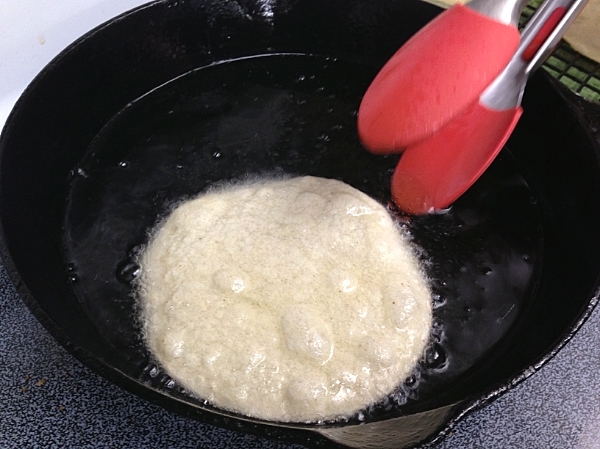 Soften tortillas by frying them in hot oil for a few seconds, not too long, you don’t want them to get crispy. Drain on paper towels or a cooling rack. 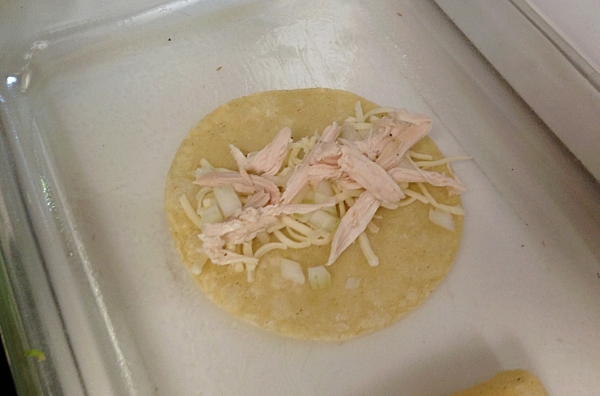 Once cool, fill tortillas with chicken, onions and cheese (use about half the cheese). 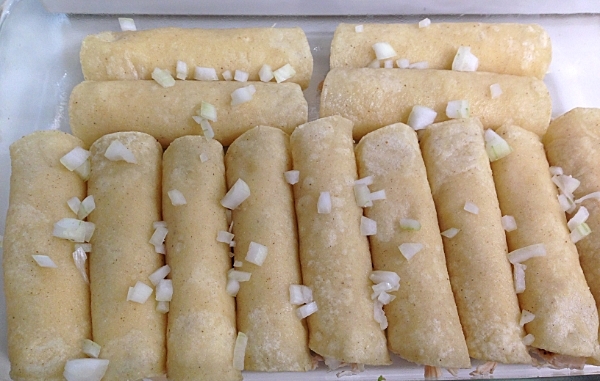 Roll them up and place them in a large shallow pan. Melt 1/4 cup of butter. 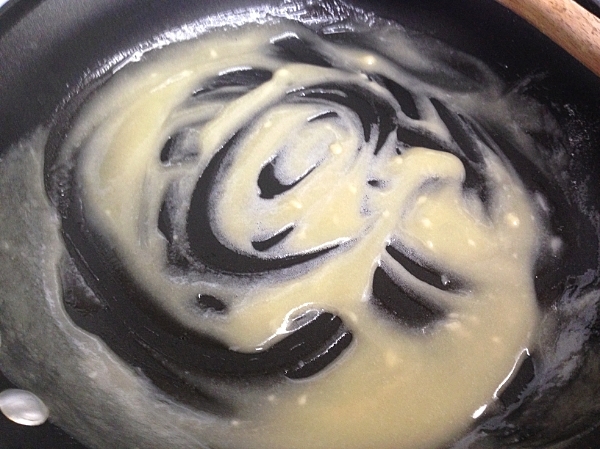 Add flour and whisk until a light, blonde roux has formed. Slowly add in chicken stock while continuously whisking (you don’t want to break your roux). Cook over medium heat until thickened. Add sour cream and cook until hot, but do not boil. 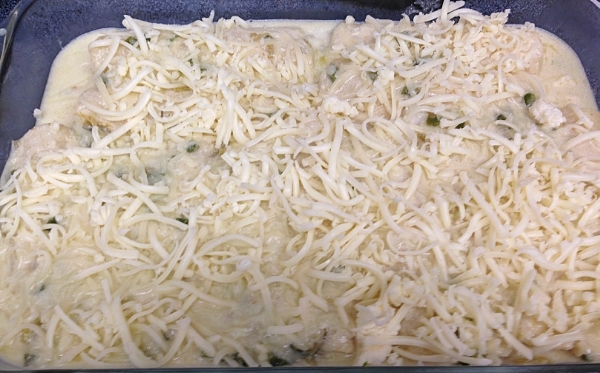 Add jalapeno peppers and green chilies and some extra Monterrey Jack cheese if you feel like it. We did and it really adds flavor to your sauce. Pour on the sauce and add a little extra cheese for good measure. Or a lot of cheese, I won’t stop you. Cook indirectly on your BGE, cooker or smoker for about 25-30 minutes at 375F. If you are cooking in an oven, 350F for about 20 minutes. 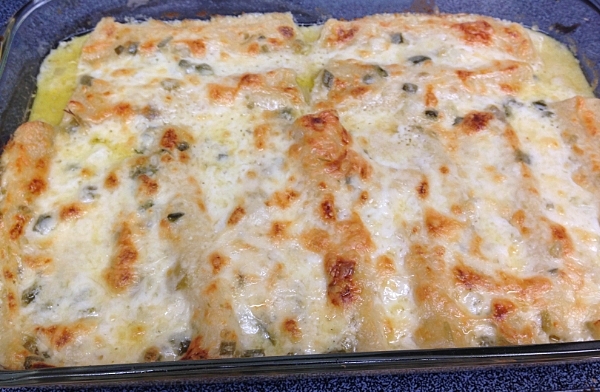 If your enchiladas haven’t “browned up” at the end of 30 minutes, pop them under the broiler for a few minutes. 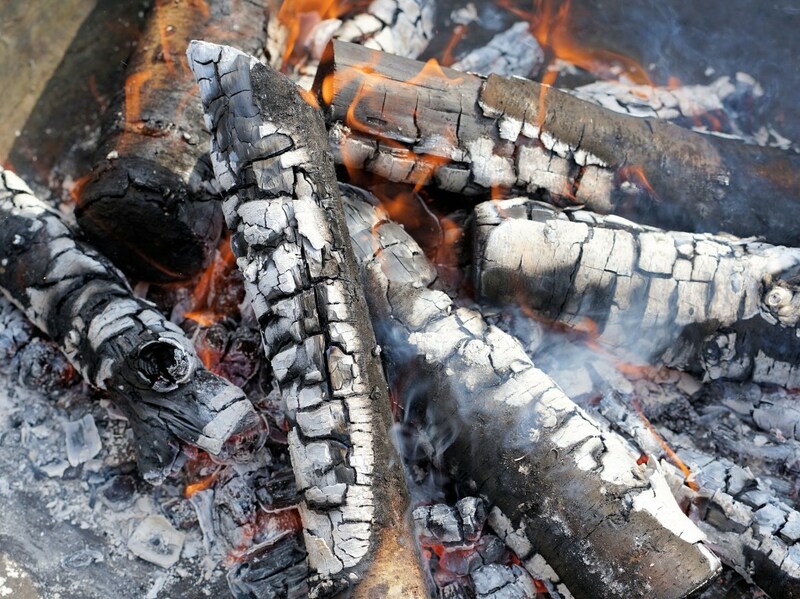 Watch carefully as they can burn pretty quickly. Top with green onions and/or cilantro. Garnish!! Now it looks better! Green onions or cilantro work well for a garnish for this dish. We opted for green onions because somebody, meaning me, forgot to get cilantro while at the store. Whoops. 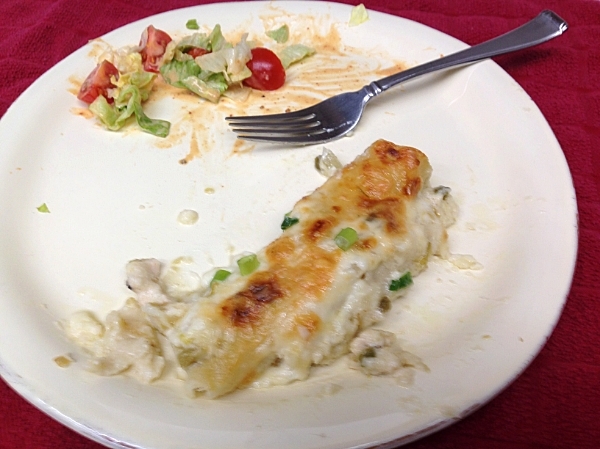 Plated it up with a simple salad of iceberg lettuce, some cherry tomatoes and green onions and chipotle cheddar salad dressing for a cool, crisp contrast with a bite of heat to the creamy, cheesy enchiladas. For a relatively quick and easy meal, this one packed quite a bit of flavor. 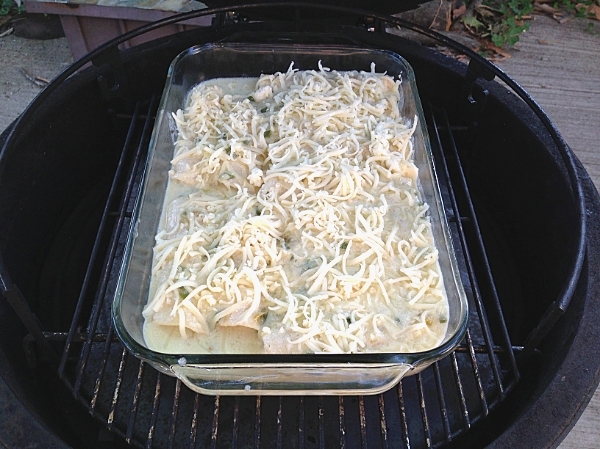 They had just a bit of smokieness from the grilled chicken and then cooking the enchiladas on the BGE. 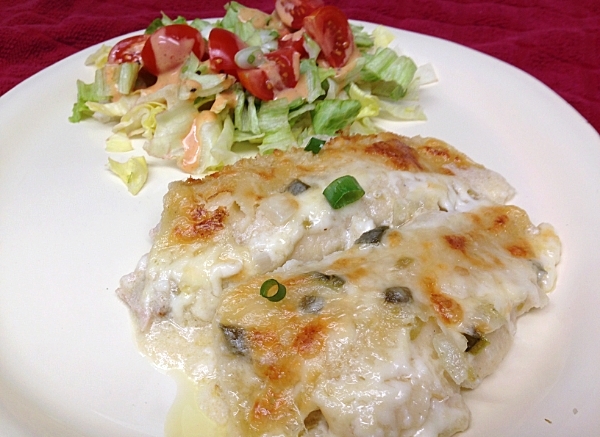 Creamy and cheesy goodness with just a hint of heat from the jalapenos. I opted to take out the seeds and veins on the jalapenos. That’s where the majority of the heat is stored and taking them out removes the heat but still gives you a nice flavor. I think next time I’ll leave them in as I wanted a bit more heat. Either that or get the Monterrey Jack cheese with jalapeno peppers instead of plain ole Monterrey Jack. Other than that, I’d leave it just the way it is. Certainly. Where’d you go in Frisco? It’s called Manny’s. Not bad. Just not my Tex-Mex bag. Yelp review forthcoming. Great minds think alike, my friend. 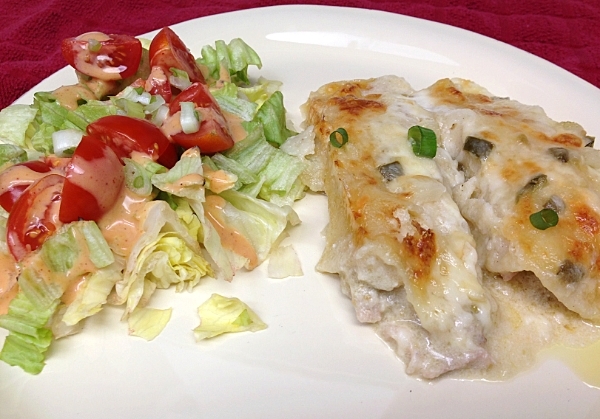 We had the chicken enchiladas for dinner last night too. Though mine weren’t as creamy-looking as those beauties are. Wow, they look delicious. These look amazing. Ah-mazing. I love the look of that creamy sauce, I’ve made chicken enchiladas plenty of times but never with that wondrous, cheesy sour cream blanket. Need to make these. Now.